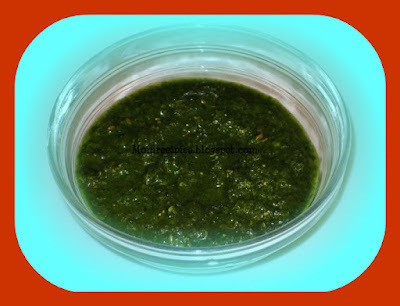 Green chutney is also known as Hari Chutney. This dip tastes great and delicious with Pakodas,Samosas,Dhokalas ,Chaat,Tikkis and many more Indian Snacks.It it is also used as a spread on bread slices to make different sandwiches.This Green chutney is an integral part of Mumbai's famous Vegetable Sandwich.It can be used in many different ways. 1. First Pluck ,wash and then chop coriander and mint. 2. Combine all the ingredients except lemon jice and grind to a smooth paste in a blender using very little water. 3. Then add lemon juice . Mix well. 4. Refrigerate and use as required. 1) This can be served as a dip for snacks, finger foods ,Samosas, Dhokalas etc. 2) It can be used as a spread on Breads for making vegetable sandwich. 3) You can also use this Dip for roasted vegetables ,Chips and crackers.Mix 2 Parts of chutney and 3 Parts of yogurt. 4) It can be used for making Bhel (Mixture of puffed rice with Farson, an Famous Mumbai Street food). 4) It can be used as Salad Dressing also.